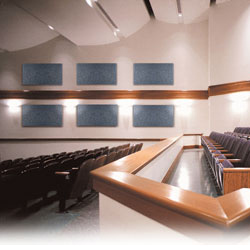 Sound Silencer™ panels are easily installed for improving sound control in many environments. Sound Silencer™ is non-fibrous; class A fire retardant, non-abrasive, water resistant, impact resistant, lightweight, mold bacteria and fungi resistant. These panels have both a NRC and STC rating, a tackable surface and can be used indoors or outdoors. Sound Silencer™ can be used as a ceiling title, wall panel, outdoor barrier or hanging baffle.